I am a little late in talking about these books that I read for Witch Week hosted by Lory at Emerald City Book Review, but I wanted to make some quick notes. The first is the classic, Something Wicked This Way Comes by Ray Bradbury and the second is a new title by Kelly Barnhill, The Girl Who Drank the Moon. In this classic by Bradbury two best friends, the almost 14-year olds Will and Jim, spend a horror-filled weekend together trying to get away from a hellish carnival. Told in a lyrical, almost poetic style that I really wanted to appreciate, I have to admit I was confused by it. I had to constantly reread and frankly, if I had not committed to this book for Witch Week, I think I would have ditched it soon after starting! But I persevered and discovered my confusion worked. My confusion was the boys’ confusion. Is Mr. Cooger really dead in the electric chair? And that little girl under the tree was Miss Foley their teacher who by nasty magic regressed in age? And whoever thought a hot air balloon could be so sinister as to hold a witch who was looking for fresh meat? And the Illustrated Man, I mean Mr. Dark, what was he and was he really going to take the boys into the carnival for ever and ever like some marionette doll? One thing this style of writing did for me was to cast a spell over my imagination and force me to see a world of dimness and blurred vision. All the action happened at the edge of darkness, in fact, I don’t think the sun ever came out and coupled with a storm approaching and plenty of the action happening at night, I just felt weighted down. The brightest spot for me was Mr. Halloway, Will’s father and the town’s night librarian, who has spent decades among historians and philosophers in his private realm of books. He is really the hero of the story, not just as the boys’ physical savior, but also as a voice for speaking your heart and emotion in the way he opened up to them about life. “Who are you?” both father and son asked and answered to the best of their ability. This ordeal surely strengthened their bond. And finally, I really appreciated that the resolution to the horror carnival was to share love and joy. That because the carnival fed on the sorrows and disappointments of people, the cure was to be happy. Charles Halloway discovered this when he fought off the witch. What a comical scene: the evil old witch wiggling her hand in the air to slow his heart to a stop, while he is feeling it as tickles on his chest and cannot contain his laughter which in turn blows her out the door! And I suppose that is about as good a resolution as they come because the alternative, to meet violence with violence, is always temporary. This is a beautifully told story of magic and witches, love and community…and a very big misunderstanding. For centuries, each year the people of the Protectorate give up the youngest child among the families to the witch who lives in the forest as an appeasement against her doing anything terrible to the town. The ritual is performed with much solemnity, with only occasional protest from the parents, such is the belief in the efficacy of the sacrifice. On this particular day, however, the mother will not let her little daughter be taken and she is ripped from her arms. The ritual goes on as planned and the baby is left on the stone for the witch to take. After the procession leaves and as she has done every year for 500 years Xan, the witch, snatches up the infant and carries it by broomstick to loving families across the forest to the Free Cities. Xan has never understood why this village leaves an infant to die, but is happy to deliver it to families who love children. However, this year she has become very attached to her charge and begins to take the longer route in order to spend more time with her, alternately nourishing the baby with goat’s milk and starlight as is normal. But she has become so distracted with thoughts of keeping this one that she doesn’t see that the moon has come out when she raises her hand to the stars and draws down moonlight instead, filling the baby with great magic. The story progresses with the child Luna growing up under Xan’s tutelage, the magical creatures she plays and learns with and the mission to find her mother. Meanwhile, in the Protectorate, a young man whose child is next to be taken, decides he must end this practice and sets out to kill the witch. The misunderstanding is resolved, but not before tragedy and evil takes its toll. This is a beautifully written book with characters both magical and human that are unforgettable. Barnhill handles tension and conflict well, and writes an easy flowing prose. Though this is a book for middle schoolers, as an adult I found it a very enjoyable read. The only weaknesses in the book are due to this age difference, I believe, as I would have liked more depth to the characters. Oh, and I must mention the cover. It is exquisite. Here is a larger view. During the Spring of 2014, I was running late for the bus and remembered I needed a ‘bus book.’ So I grabbed the first unread book I saw on the shelf: The Hobbit. As I read on the way to work day after day, the intrusion of strangers and smells of the city bus left me and I was securely encased in fantasy land. I had always loved that experience. But why did it end? And I remembered I stopped reading fantasy and sci/fi when I went to graduate school…. So I spent most of last summer in used bookstores shoring up my bookcases with books by authors I recalled from the past along with new authors. I read The Golden Compass and all of His Dark Materials, I reread some Marion Zimmer Bradley and discovered sci/fi and fantasy author Lisa Goldstein and several others. I was on a roll when I walked into a favorite San Diego bookstore last summer to continue my quest. With my arms full of fantasy and sci fi books, I headed for the cash register, but something caught my eye. I saw this bright green book cover with a dancing toad in the middle. 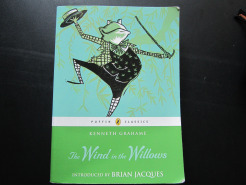 It was The Wind in the Willows and I realized I had never read it though I knew it was a well-known children’s classic. As I looked through the titles of the children’s section, I saw so many time-honored books I had never read. 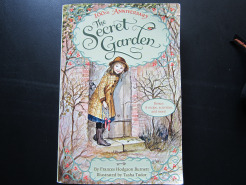 How did I miss The Secret Garden and The Wind in the Willows? 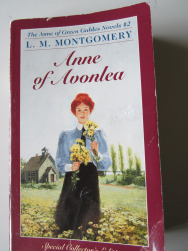 How come I never read the Anne of Green Gables series or Stuart Little? As I thought back, 12 was a pivotal reading-year. I somehow moved from the Nancy Drew mysteries and “Little House” books to A Journal of the Plague Year and On the Beach. At that age, who wouldn’t want to read about the terrors of the Black Death and nuclear annihilation?! So that day, I bought The Wind in the Willows, The Secret Garden and Anne of Green Gables, even though I wondered if they would have any meaning for me or would they be a waste of time for an adult? Each is so rich in the details of its surroundings and descriptions of characters, with plots and subject matter that are complicated and mature. They are like historical documents in disguise giving me a view of their time period by word choices, societal consciousness and world view. What drew me to books at a very young age, draws me still: a good story with characters I can see and hear and whose conflicts and resolutions are relatable; and with a little magic and fantasy thrown in like talking animals, personified Nature and extraordinary images and ideas of life. What stays with me is the beautiful simplicity in the writing, the stunning portrayals of time and place, the universal spirituality found in Nature and the images and impressions that follow me long after I have finished the book. I am moved, too, because I am reminded these creative and fantastical images are missing in my life. Adults, after all, are supposed to ‘grow out of it.’ There are so many of these children’s classics I have yet to read, yet I still feel tentative in pursuing them. And if you want to stay intelligent, read fairy tales as an adult!